Clifford Brycelea had set his mind on a master s degree in commercial art ... or so he thought in 1976. That was before his mystical paintings of southwestern Indian culture began selling like hotcakes. Before he met up with western novelist Louis L Amour. Before, in short, Brycelea realized he already had a career in art. Today, Brycelea s subject matter is as varied as the many media he uses. Yet a mystical thread remains strong in his work, especially in his landscapes. Executed in deep browns, eerie ochres or slightly surreal greens, they seem to repeat an ancient ceremonial chant: "It all returns and ends in the land." Remote hogans, solitary tipis, bare trees and shadowy birds ostensibly hearken back to the old days. In fact, however, they carry an urgent message for the present. "If you study my paintings, you ll see they relate to our Mother Earth," says Brycelea [pronounced Brice-lee]. "The environment s like anything else. You have to read the instructions or you ll break the thing." Brycelea (Az 1953—LIVING NM) learned his ecology among the pinons and junipers of the Lukachukai Mountains on the Navajo Reservation near Cove, AZ. His traditional upbringing included a boarding school education that began when he was 5 years old. In second grade he remembers doing two drawings on the opposite sides of a sheet of paper: One he liked and one his teacher liked. The latter drawing won first place at the Northern Navajo Fair in Shiprock, NM, and from the experience, Brycelea absorbed an invaluable lesson: Artists aren't the best judges of their own work. Brycelea forgot about art until high school at Fort Wingate where he took a class in oil painting ... which he almost flunked. "I couldn't do anything with oil, I was a total wreck," he chuckles. But his drafting skills were popular with his classmates, who pestered him for pencil and pen-and-ink drawings for the yearbook. Then, while leafing through Arizona Highways, Brycelea discovered another level of illustration in the works of Robert Draper, Jimmie Abeyta and Harrison Begay [SWA JUN 821. Begay s work especially intrigued the young high-school student. "His images were strong, like dreaming something and making it real." Another source of inspiration was his uncle Harry Walters, an artist, art instructor and past director of the Navajo Ceremonial Museum (now the Wheelwright Museum, Santa Fe, NM). Nonetheless, Brycelea was leaning towards trade school rather than college when he met with his high-school guidance counselor to map out his future. She discouraged Brycelea from pursuing higher education, telling him that athletes might make it through college, but he wouldn't. That s when Brycelea resolved to prove her wrong. bewildering variety of art classes. One of his principal instructors was Mick Reber, who specialized in commercial art. "I still use that commercial approach today," explains Brycelea. Strong horizon lines and perpendiculars predominate in his work, as do eye-directing curves and diagonals. These, combined with his compositional economy, make his paintings easily adapted for use as illustrations. While in college, Brycelea s subject matter reflected other-worldly concerns of a type that might surprise his present collectors: spaceships and aliens, for example. 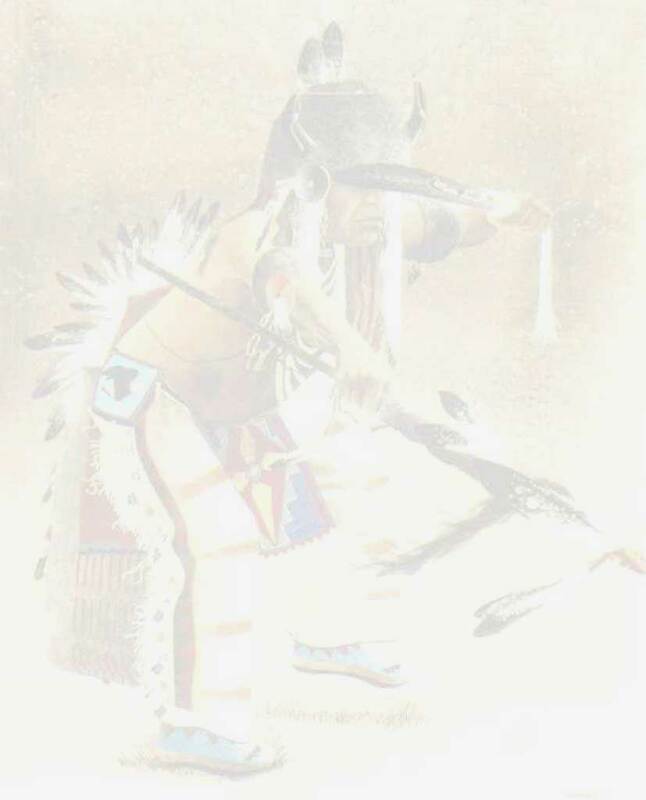 It was only after graduating from Fort Lewis in 1975 that he tried his hand at Indian images. Finishing a group of watercolors, he took them to the Jackson David Trading Company in Durango, CO. Owner Jackson Clark specialized in Indian jewelry and rugs and was just beginning to expand into the visual arts. In a sense, the two men learned the art business together. Clark took Brycelea s paintings on the road with his other inventory and when he found he couldn't field questions about them, he invited Brycelea to accompany him. "We taught each other," observes the painter. "We talked to other artists, picked up marketing tips and went from there." Clark encouraged Brycelea to enter his work in competitive shows and within a year he started turning up ribbons and purchase awards. Still planning to return to school for a master s degree, Brycelea was sidetracked by western writer Louis L Amour, who purchased his first Brycelea painting in 1977. L Amour was living in Beverly Hills, CA, at the time but he d come to Durango and stay at Tamarron ski resort while researching his novels. When he went downtown he d stop at the Trading Company. Recalls Brycelea, "Jackson Clark introduced us and we just evolved into close friends." The painting that caught L Amour s attention was of a kneeling man in a kachina mask, above whose head floated an ancient-looking design. That design— remote yet challenging, seemingly capable of good or evil—would be perfect for his yet-unfinished novel titled Haunted Mesa. The subject of the novel was the mysterious Anasazi who vanished from the Four Corners region sometime around the thirteenth century. Brycelea, who was similarly fascinated with the Ancient Ones, often depicted their vacant cliff dwellings in his art. When L Amour learned that Brycelea planned to stop painting and return to school, he invited the young artist to dinner. "He saw something in my work and in me," recalls Brycelea. "He thought I should continue in art." The novelist backed his encouragement with action, arranging a private showing for the artist at his Beverly Hills home in 1981. L Amour would subsequently use Brycelea images to illustrate two short stories as well as the novel Haunted Mesa, published in 1988. Brycelea contributed more to the novel than its book jacket, however. He shared with the writer some of the Navajo beliefs that inform its plot and served as a model for one of the book s characters. Although Brycelea left Durango for Cove, and then Dulce, NM, he and L Amour remained close friends till the author s death in 1988. L Amour collected Brycelea s watercolor landscapes. Their bare-bones scenery and idyllic remoteness seemed, like L Amour s novels, to praise the untrammeled spaces of the West. "With the world as crowded as it is today, I try to use a lot of space in my work," Brycelea explains. "I want to create the kind of place where you feel you could go to relax and no one would bother you." SUMMER RAIN is a good example. Though a bit more elaborate in composition than most of his landscapes, the tranquility of the land and the inviting shapes of the sienna-colored hogans convey the mystery and intensity of a sudden desert cloudburst. Brycelea s landscapes are above all private places where the mind and eye can rest free from sensory overload. At the same time there is a poignant quality to these paintings, a warning that the physical equivalents of these landscapes may soon go the way of the dinosaurs. Notes the artist, "You might see a pine tree in my work—it will be halfway green but the rest of the way to the top it s dried up." Indeed, all these images are colored by a certain ambivalence. Birds generally evoke associations of freedom for Brycelea but their dark silhouettes, few in number, foreshadow another concern. "You hear on the news how people are killing eagles and other birds. Someday all that ll be left will be scavengers." The small scale of the landscapes arose partly out of necessity. "I started doing miniatures in 1985 when I was traveling from one show to another," he says. With but three weeks in between these weekend stands, Brycelea found he could create miniatures despite road distractions. And, as it turned out, the small size strengthened the impression of intimacy he sought to create. Brycelea still avoids oil paints, preferring watercolors and acrylics for his landscapes and southwestern Indian subjects and pen-and-ink for whatever strikes his fancy. The success of this approach may be gauged, among other things, by the four gold medals he has earned thus far from the American Indian and Cowboy Artists group with whom he shows in their annual April exhibition. And by the title Brycelea won in 1987 of "Indian Artist of the Year" from the Indian Arts and Crafts Association. In fact, 1987 was a banner year for Brycelea—in addition to the Haunted Mesa book jacket, his illustrations also appeared in Pieces of White Shell by Terry Tempest which was named the Southwest Book of the Year. In 1988, after a three-year hiatus, Brycelea experimented with returning to his mythic painting theme in Putting Up The Stars. The response was overwhelming. "Customers called me and came by, saying that they remembered me for that style." Approaching his ceremonial subjects with care, Brycelea places sand painting figures, for example, anywhere in the image except on the ground. That might offend his Navajo viewers. On the other hand, he feels free to exercise his creative imagination by combining Navajo stories with myths or motifs from other southwestern tribes. It was the Anasazi he thought of when painting PUTTING UP THE STARS. "At one time, the sky was completely dark," relates Brycelea. "People wanted something to light it up, just a little bit, so they asked the spirit people to help them." Brycelea depicts his Shooting Star Kachinas atop a kiva located in thin air. Their elaborate masks and glowing body paint emphasize their supernatural powers. The kachinas hold black bowls from which the stars shoot in all directions like fireworks, while one kneeling spirit records their placement in the sky. The dazzling paths of the stars, the mysterious grandeur of the kiva and the aerial view of the river all enhance the ethereal effect of the image. It was this range of subject matter that won Brycelea his IACA title, presented, appropriately enough, by Jackson Clark II. In 1981, the Durango trading company evolved into Toh-Atin Gallery and a second generation of Clarks now handle Brycelea s art. His gallery connections have proven crucial in another area too. He met his wife, Edie, in 1987 while dealing with her mother, a Georgia gallery and gift-shop owner. Send mail to eshropshire@myrealbox.com with questions or comments about this web site.